In the cap world of the NHL every team should be looking at every market inefficiency possible to try and maximize the advantage for their team. Being able to exploit loopholes and finding these advantages within the Collective Bargaining Agreement (CBA) is very critical within the scope of today’s NHL. The long term contracts, with minimal payments at the end, under the previous CBA that General Managers would often give top end talent is an example of this. With that loophole closed teams are always on the lookout for others. The second is an interesting concept written about by Draglikepull on PensionPlanPuppets. The full details of this tactics can be found here. The summary of the article is that the Toronto Maple Leafs are in a unique situation in that they are only 2 kilometres from their AHL Affiliate the Toronto Marlies. They are able to exploit this advantage by finding ways to maximize their money spent towards the salary cap. The way the salary cap is calculated is on a daily basis based on money spent towards salary in that 24 hour period. Theoretically if you could reduce your roster temporarily to the league minimum you can reduce the money being spent by a few thousand dollars a day. If you can do this consistently over the season you could save your team a couple hundred thousand which can help your team as they approach the trade deadline and are looking to pick up some higher end talent. This is what the Toronto Maple Leafs are doing; by consistently shuffling Stuart Percy, and more recently Sam Carrick, between the NHL and the AHL they are saving over $4,000 a day which could lead to over $185,000 in the course of a full season. This only works with players who are waiver eligible and you have to manage your assets by not agering them by paying them an AHL wage every second day. The questions then become: can other teams do this and is it allowed? The first question becomes a matter of distance. I’ve compiled a full list of NHL and AHL affiliates and the distances between them updated from the work done by WannaTalkHockey, this can be seen below. In order for teams to be able to move their players between their AHL affiliate and their NHL home club they need to be a reasonable distance apart so that call-ups do not take an un-reasonable time to move between the clubs. If we assume that 2.5 hours to travel by vehicle, between the two clubs, is the maximum reasonable distance then there should be 10 clubs who could exploit this cap loophole: Toronto, Boston, Philadelphia, New York, Buffalo, Chicago, New York, Washington, New Jersey, and Detroit. 14.8 Reporting Time. A Transferred Player shall be afforded a reasonable time-frame in which to report to his new Club or minor league club. There was nothing in the CBA stating that a player must physically report to their minor league team. This makes sense as one-day moves do happen often to help get around the 23 man roster limit as well as trade deadline paper transactions to keep players eligible for the AHL playoffs. When I took this topic to twitter I got various answers that said both players do and do not have to physically report to their clubs, even for these minor moves. Everyone was reporting they heard from second-hand sources but no one could pinpoint an exact source saying physical reporting was required. NHL teams can suspend their players for not showing, and clubs can reduce their salary for not showing up to training camp, but if the team is telling a player to not physically move then I doubt they would suspend their player. The league can suspend players for off-ice actions; this might fall under that scenario though I would suspect the league would punish the teams if this were not allowed. There were some second-hand reports of the NHL auditing teams to make sure this does not happen, but again there were no sources identified. If this is not allowed, that still leaves around 10 teams who could be employing this method to help save cap space but are choosing not to. This seems like mismanagement to myself to not be exploiting advantages to give your club the best possible chance. The teams who are operating the cap roof are less likely to be worried about the other associated costs with moving their players so I am surprised this is not being exploited more often. 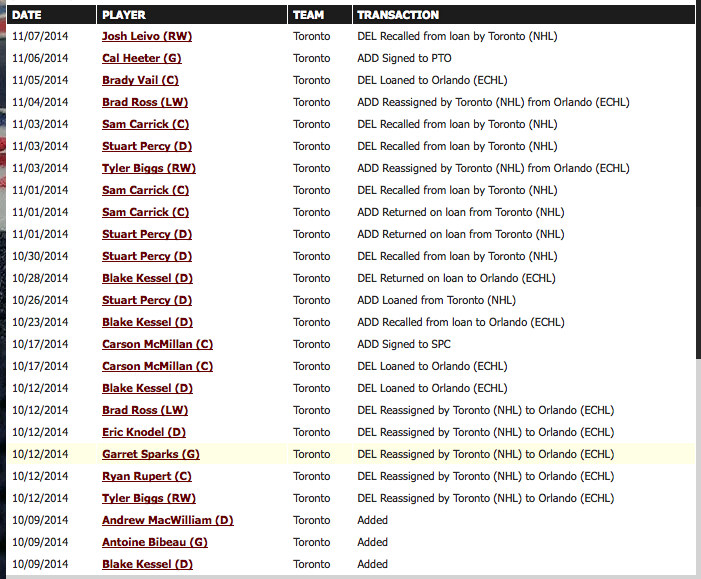 It’s good on Toronto’s part to be doing what they can to be as competitive as possible. I would not be surprised to see other teams follow suit until the league closes the loophole in the next NHL lockout.